Once upon a time this merry little place was apparently the venue for many a turn of the century sing-along. Nicholson’s website makes boast of the fact that Gilbert and Sullivan belted out a few tunes here and given that it is in the midst of some of the oldest theatres and music halls in the city this isn’t tough to imagine. Sadly I can also imagine to grimace which would be cast across their moustachioed faces if they were, as I was, subjected to the bloodcurdling screeching of Katie Perry whilst trying to enjoy a pint. Casting aside the fact that music has gone downhill a bit lately we can concentrate on the numerous god points about this pub. Generally speaking it’s a bit of a belter. It benefits from the opulent decoration style of a Victorian pub and is not too dissimilar from The Princess Louise in Holborn in that you get the impression that someone was showing off. Tightly carved wooden panelling adorns the walls an intricately sculpted fire place hides towards the back and someone’s rip off of the Elgin marbles runs around the bar at ceiling level. Wherever you gaze there is something fairly exquisite. 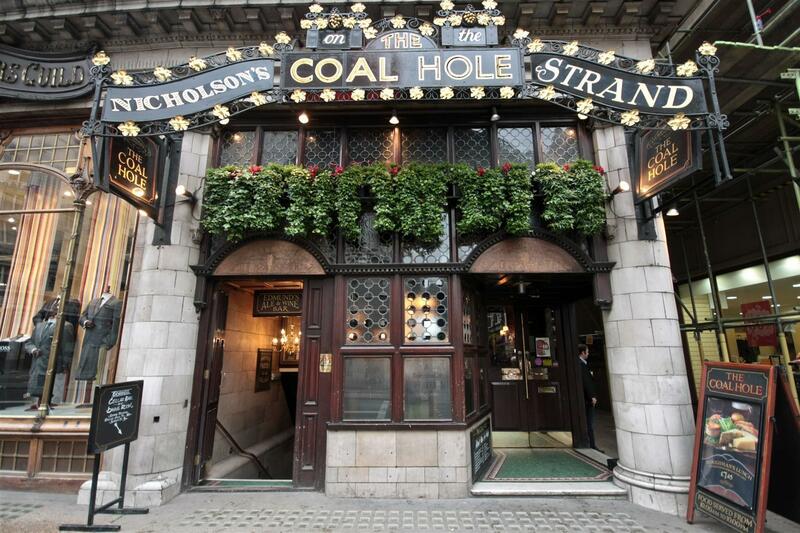 These days The Coal Hole, named as it is rumoured to have previously served at the coal cellar for the nearby Savoy hotel, doesn’t play host to a bunch of starched shirted industrialists warbling out another rendition of knees up mother brown but plays host to a more down to earth crowd. A healthy mix of pre theatre drinkers, post work city blokes and mid sight seeing tour out of towners makes for a nicely humming atmosphere in the evening. There’s a healthy set of options at the pumps to choose from with five real ales to mull over and annoy everyone else whilst making your selection. My only major gripe about this pub actually comes from my experience at the bar. Given that the pubs website boasts ‘a generous measure of famous British hospitality’ I was nothing short of impressed that the bar man managed to conduct our entire transaction purely with grunts. All in all a bit of a mixed bag but if you strip away the dreadful music and encourage the staff to use words you’ve got a good pub here. Definitely worth popping into.